The Iraq War was a protracted armed conflict that began with the invasion of Iraq on March 20, 2003, 1½ years after the traumatic 9/11 attacks, by a U.S.-led coalition. The invasion began with a “shock and awe” bombing campaign. Iraqi forces were quickly overwhelmed as U.S. forces swept through the country. The invasion led to the collapse of the Ba’athist government of Saddam Hussein, who was captured in December 2003 and executed by a military court three years later. But the war continued for much of the next decade as an insurgency emerged to oppose the occupying forces and the post-invasion Iraqi government. Worse still, Saddam’s former military officers morphed into ISIS, which became the Islamic State. (See “Blowback: ISIS leaders are former officers of Saddam Hussein’s army”) Although the United States officially withdrew from Iraq in 2011, we became re-involved in 2014 as the Iraqi government proved itself unable to cope with ISIS. An estimated 151,000 to 600,000 Iraqis were killed in the first 3–4 years of conflict. 6,045 Americans were killed: 4,491 soldiers; 1,554 contractors. Additionally, 76,106 Americans were wounded: 32,226 soldiers; 43,880 contractors. The Iraq War cost the U.S. government more than $845 billion — $720 million a day, if one takes into account the long-term health care for veterans, interest on debt and replacement of military hardware, according to Nobel Prize-winning economist Joseph E. Stiglitz and Harvard public finance professor Linda Bilmes. The George W. Bush administration based its rationale for war principally on the assertion that Iraq possessed weapons of mass destruction (WMDs) — yellow-cake uranium poison gas, biological weapons — and that Saddam’s government posed an immediate threat to the United States and its coalition allies. Saddam was also accused of of harboring and supporting al-Qaeda, the terrorist group identified as the instigator of 9/11. The rationale for the Iraq War has since been discredited. But a newly-declassified report to the then-Joint Chiefs of Staff provides even more evidence that the Bush administration went to war with, at best, flimsy evidence of Iraq’s WMDs — a war in which 6,045 Americans lost their lives. John Walcott, adjunct professor in the Walsh School of Foreign Service at Georgetown University, reports for Politico, Jan. 24, 2016, that on September 9, 2002, as the Bush administration began its public-opinion campaign for an invasion of Iraq, a classified report from Defense Secretary Donald Rumsfeld landed on the desk of the chairman of the Joint Chiefs of Staff (JCS), Air Force General Richard Myers. 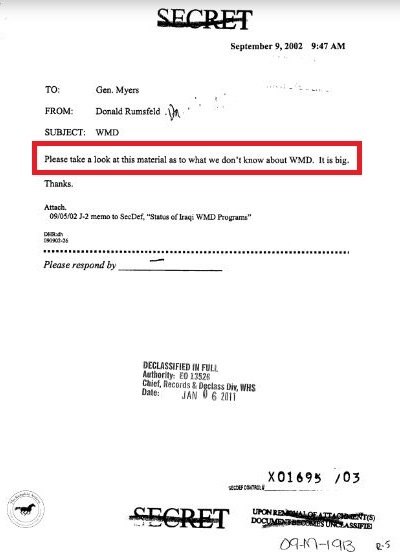 Myers already knew about the report because the Joint Staff’s director for intelligence had prepared it. Clearly, Rumsfeld’s urgent tone conveyed how seriously he viewed the report’s potential to undermine the Bush administration’s case for war. But neither Rumsfeld nor Myers shared the 8-page report with key members of the administration such as then-Secretary of State Colin Powell or top officials at the CIA, according to multiple sources at the State Department, White House and CIA who agreed to speak on condition of anonymity. Instead, the report disappeared, and with it a potentially powerful counter-narrative to the administration’s argument that Saddam Hussein’s nuclear, chemical and biological weapons posed a grave threat to the U.S. and its allies, which was beginning to gain traction in major news outlets, led by the New York Times. Below are screenshots of the 8-page report, preceded by Rumsfeld’s memo to Myers, and Director for Intelligence Major Gen. Glen Shaffer’s memo to the JCS (source: Politico). I supplied the red-color emphasis. Let that thought sink in . . . . Meanwhile, the Neo-con warmongers in Congress are fast-tracking a resolution to give Obama unlimited war-making powers — unrestricted in time or geography. Senior Airman, Brian Kolfage Jr., is the most severely wounded Airman in US history—a triple amputee. On September 11, 2004, while serving his second deployment in support of Operation Iraqi Freedom, Brian Kolfage lost both his legs and an arm when a 107 mm rocket exploded three feet from the Airman, throwing him into a wall of sandbags. Kolfage miraculously survived the blast and after eleven months at Walter Reed Medical Center, he returned to serve in the Air Force at Davis Monthan AFB in Tucson, Arizona. Kolfage is no longer on active duty and receives monthly VA benefits compensation for the wounds he received serving our country. Incredibly, Kolfage was informed last year by the Veterans Administration Debt Management Center that he would be back charged $4825.00 because, according to the VA, they had been overpaying Airman Kolfage for several years and they want their money back. My Open Letter to Obama on Presidents day. I nearly died in a war that you and most of your colleagues supported overwhelmingly, including the two presidents who came before you. Many citizens may not agree with waging war in Iraq to free the oppressed Iraqi citizens, but it’s something that warriors like myself have zero control over. I joined to serve my country and to better my life. I’ve seen things that you could never imagine, and they have made me the person I am today. Mr. Obama, even though we share extreme opposite views, we have one thing in common, we both attended school in Hawaii. However, that’s where the similarities end. You see, as you attended your exclusive, private school, I would ride my bike to Kaimuki High school in one of the roughest areas in Hawaii every morning and would ride past Punahou, the exclusive private school you attended. I would notice the Bentleys, Maserati’s, and fancy foreign cars that all the kids were dropped off in; wow it must have been extremely rough in Hawaii living that life, right? I could only imagine what it was like to have that kind of money. Fortunately for you, not many people are aware of the school and the upper classcitizens who attended it. The tuition to attend your exclusive, private school was more than it cost me to obtain a Bachelor’s degree in Architecture from the University of Arizona. You talk a big game when it comes to financial inequality, yet I’m quite sure you have no idea what it’s truly like to have sacrifice. You were one of the elitist children in Hawaii. After High School, we each chose very different paths. You were able to attend Ivy League schools, and I sought out a military career to in hopes of earning a degree. What we have in life as children usually sets the tone for what we will face later in life that will make us successful. I worked to get where I am today, and YOU WERE HANDED IT….Mr. Inequality. While I was in Iraq, our mission was to liberate the Iraqi citizens from a tyrant and that’s what we did. Never forget, it was your people who sent us there, like the Clintons, John Kerry, Nancy Pelosi & Carl Levin. However, since the day you busted onto the scene you’ve been talking about ending the war and pulling the troops out, not understanding the blood sweat and tears that so many Americans and Iraqi’s invested. And with complete disregard for every life sacrificed, every limb lost, and every broken family, you bailed on our mission to pursue an agenda that was completely centered on your re-election in 2012. If you didn’t bail on Iraq you were worried that you may not get re-elected and that’s a fact. Just before elections on Oct 11, 2012 you said “Al Qaeda is on the run and Osama bin Laden is dead.” Look at Iraq now, they are in shambles and the Al Qaeda flag is flying freely. Clearly, you’re unfit for duty as a Commander in Chief. You put your own agenda ahead of America’s agenda, and now you have single handedly ruined and destroyed nearly everything we gained in Iraq. It clearly means nothing to you, because the only thing that you’ve personally invested in that country was a promise to bail on them. However, people like me gave limbs, friends have died, and we’ve watched families destroyed by war’s aftermath. You’re just another elitist rich thug who’s pretended to live the rough life growing up in the inner-city. You’re only worried about your own agenda and furthering your party instead of taking care of Americans. Your inability to be a leader at some of the most critical points has caused both of our wars to fail. You’ve been a joke to most of our veteran community and we have no faith in your ability to lead. Interestingly, Kolfage’s letter posted on Secrets of the Fed received 1315 thumbs up and 3130 thumbs down. I gather from some of the comments I’ve read that the thumbs down votes are by readers who think the United States should never have gone into Iraq in the first place. “Left-wing trolls launch vile attack on Iraq war veteran and triple amputee,” Examiner.com, Feb. 7, 2014. Brian Kolfage’s page on Facebook. H/t FOTM’s Wild Bill Alaska. Every modern U.S. President has a doctrine that articulates his worldview and foreign policy. As an example, reacting to America’s Vietnam War experience, the Nixon Doctrine was that the United States would no longer be the police for every and all in Asia. Henceforth, the countries of Asia-Pacific would be responsible for their own defense. George W. Bush’s doctrine was that warfare is fundamentally altered by the Islamic terrorist attacks on the U. S. homeland on Sept. 11, 2001, and by the changed nature of America’s enemies from state actors to include non-government terrorist groups. As a result, America has the right to undertake preemptive attacks when and where we identify a terrorist threat. It is the Bush Doctrine that justifies our wars in Iraq and Afghanistan although neither government nor country had first attacked the United States. Foreign affairs pundits have noted the peculiar lack of an Obama Doctrine although his first (and last) term is already drawing to a close. Never fear! Fellowship of the Minds has discovered the secret Obama Doctrine! One of FOTM’s regular commenters, moxielouise, asks us to pray for her friend Z, a former Marine who was deployed to Iraq. After he left the service and returned home, he couldn’t find work in America. So he’s now back in Iraq, in a dangerous area, working for a private contractor. No U.S. troops remain in Iraq since the last 13,000 U.S. troops were withdrawn in December 2011. But our troops are still in that hell-hole called Afghanistan. Our war there is now the longest war in U.S. history. Please say a prayer for Z and for all our soldiers serving in danger zones across the world — that God sends His angels to watch over and protect them.